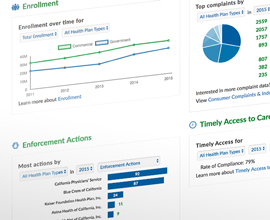 Select a health plan by using the search window above or choose from a list of all plans. 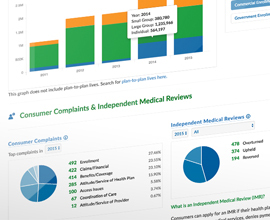 View the DMHC Dashboard for a comprehensive look at DMHC health plan data. The Department of Managed Health Care (DMHC) is soliciting bids for certified shorthand reporting services. Click to view the agenda for the public meeting. Participants may also join via conference line at the phone number listed in the agenda. For more information visit the Financial Solvency Standards Board Webpage. The Department of Managed Health Care is seeking dynamic and solution-oriented healthcare professionals and advocates to serve on the legislatively mandated DMHC Task Force on Pharmacy Benefit Management (PBM) Reporting. For more information, please read the Solicitation for Members and Description of Task Force Responsibilities. Interested candidates must submit required documents by April 19, 2019. Click to view the agenda and presentation for the public meeting. 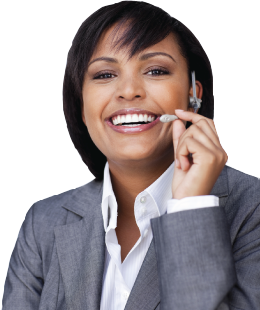 Participants may also join via conference line at the phone number listed in the agenda. Update: The DMHC approved Delta Dental’s purchase of an interest in Moda on Thursday, February 21, 2019. 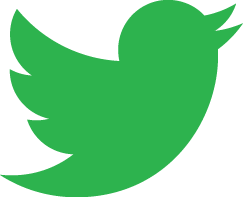 Delta Dental of California (Delta Dental) filed notice with the Department of Managed Health Care (DMHC) on September 6, 2018, to purchase a 49.5 percent interest in Moda, Inc, (Moda) an Oregon insurance company. Moda is currently owned by Oregon Dental Services (Delta Dental Plan of Oregon). 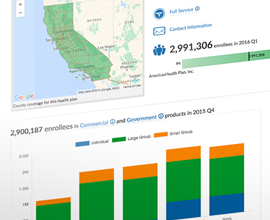 Delta Dental is a DMHC-licensed plan and reported approximately 25,043,000 dental enrollees as of September 30, 2018. Moda is not a DMHC-licensed plan. 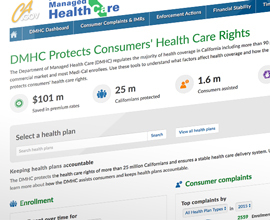 This FAQ provides information on the DMHC’s authority and review of this filing. 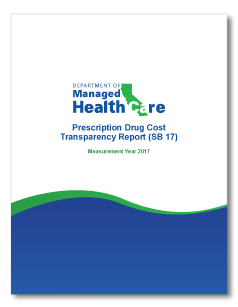 The Department of Managed Health Care Prescription Drug Cost Transparency Report (SB 17) is now available. Click the image to view the report. 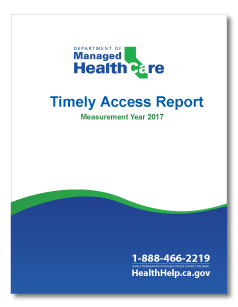 The Department of Managed Health Care Timely Access Report for Measurement Year 2017 is now available. Click the image to view the report. The Department of Managed Health Care 2017 annual report and infographic are now available online. Both of these documents highlight the DMHC’s activities during 2017 and include key statistics about the Department. What can I do if I am denied care? What can I do if my health coverage is ending?